The most romantic day of the year is here! Whether you plan a luncheon for your family and friends or if you have a romantic dinner for two, these inspirations are sure to spark your creativity. Pretty is the first word that comes to mind when enjoying this Valentine’s Day tablescape design. 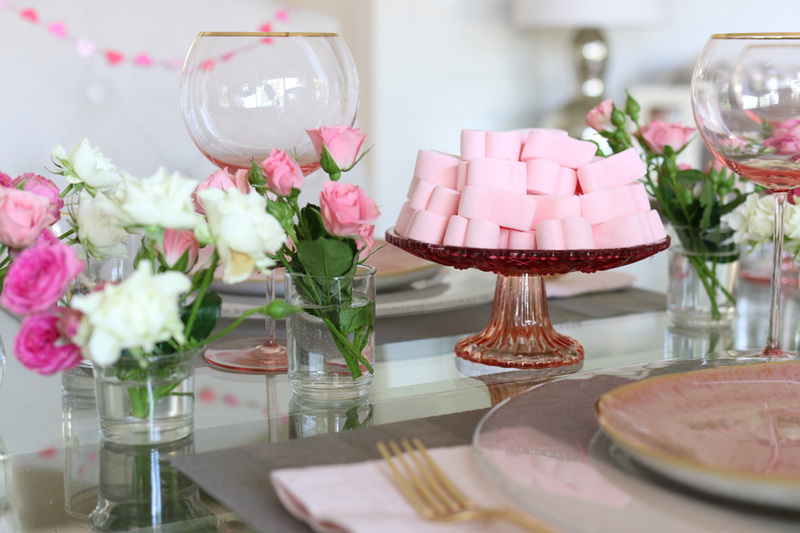 Sprays of rosebuds in clear glass bud vases set the tone for the pink crystal wine glasses with gold rims and rose cake stand with fluffy pink marshmallows on top. This is perfect with soft pink linen napkins, gold flatware, and lovely pink stoneware plates. What could be more refreshingly modern and hopelessly romantic than this clean and crisp Valentine’s Day tablescape? You will set this table up in no time! That’s because this feminine luncheon design is simple and to the point. Use garlands of small green leaves down the center with an assortment of white candles and holders. Add delicious and colorful strawberry daiquiris in crystal stems for an inviting and cheerful arrangement. It’s so clever the way these two cake stands stack together surrounded by gorgeous orchids and candied hearts with a perfect little cake on top. Tiny glass vases hold flowers and bits of candy while the blue and white tabletop linens exude with charm. This design is sure to make everyone at your table feel the romance. I hope these pretty, simple, and elegant tablescapes give you the inspiration to create the perfect design for you. I wish you the most romantic Valentine’s Day ever!